An emPSN network connection is so much more than an internet connection. We explain what is behind your connection and what makes it work so well and reliably and most importantly, why it is so special. Your emPSN schools network connection connects your school directly on to the dedicated regional schools MPLS (Multi-Protocol Label Switching) network at one of the two main network nodes in Data Centres in Derby and Nottingham. The Network Nodes are connected together with a 10Gb connection and are fully resilient. The connections between the circuit providers, BT, talk-talk and Virgin are resilient with auto failover routing traffic in to the embc network. The data centres each have a pair of industrial standard firewalls (managed by Dell Secure Works, one of the world’s leading firewall management and support companies) through which they connect to the Janet Network. So the embc has a fully resilient 10Gb connection to the Janet network. 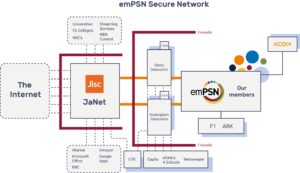 The Janet network is part of the UK critical national infrastructure connecting schools supplied by regional broadband consortia, colleges, universities, research institutes, large sections of local and national government and service providers such as Google, Microsoft, the BBC and many more. The Janet network is then firewalled to the Internet itself. For schools this means that any traffic directed to any of the bodies connected to Janet remains on network and does not traverse the internet providing benefits both in security and delivery (e.g. Office 365, Google Apps. Microsoft updates and even steaming video services associated with other websites). The National Education Network (NEN) connections are delivered over Janet giving schools access to educational content and services not available over the internet. For embc schools this include Pathe news, Audio Networks, Listening Books and teaching and learning materials from the other school’s regional broadband providers. The emPSN infrastructure that delivers the embc schools network is carrier class meaning that it can deliver multiple networks enabling private networks to be constructed for different users e.g. Academy Chains. It is used to deliver Public Sector Networks (PSN) for a number of authorities across the East Midlands. In doing this it is part of the national PSN and has to meet the stringent security standards specified by the PSN Authority and Cabinet Office both in its construction, delivery and management. A number of school services providers (eSafety4Schools, RM, and Capita) are directly connected to the embc network through a further pair of industrial standard firewalls so once again any traffic to them remains on network. Several schools support companies are connected to the embc network enabling them to get on-network access in supporting and developing in-school networks and services. The emPSN network infrastructure has been managed by KCOM since its inception in 2000. There is a national Network Operations Centre which monitors the network 24hrs a day, 7 days per week. Any failures right down to the router in your school is alarmed in that Data Centre enabling faults to be detected and rectified quickly. Reliability and availability are key to schools in their use of technology and the design and management of the embc network is purpose built to deliver it to schools across the region. Both are available to download as a PDF from the NEN website. Other guidance documents are available to download on the NEN site.